National institutes of S&T showed the innovative strategies of Korea. UNIST will raise excellent research brands of a carbon fiber, a second battery, etc. The Ministry of Science, ICT and Future Planning of Korea, UNIST and three other national institutes including KAIST, GIST, and DGIST proclaimed the innovative vision and a new role of national institutes of science and technology (S&T) at Grand Ambassador Hotel in Seoul on December 1, 2015. UNIST has been focusing on raising about ten research brands such as the next generation’s energy, new materials, biomedical engineering, a carbon fiber, a secondary battery, and so on. 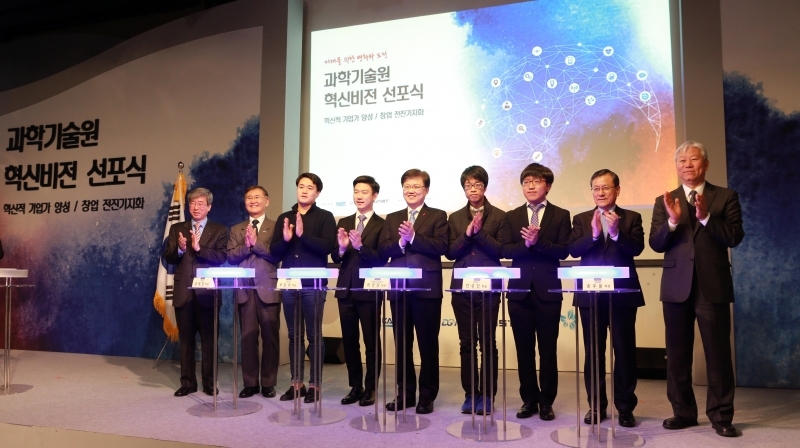 President Mooyoung Jung said, “UNIST will develop about ten outstanding and useful research brands with the local companies in Ulsan.” Also, UNIST will run the UNIST Family Company & Venture Star-up program in order to study about topics which are necessary in local industry. UNIST showed the innovative vision to suggest that it will not only stay as the research university but also grow as the international research institute. It will grow with the local and international companies in the world. Developing the new and useful technologies and contributing them to the human life will be the first and most important project for UNIST.